Home > Managing Tenants > Tenants and Gardens: Who is Responsible for Maintenance? When a tenant is checking out a home, unless they are looking at a high rise flat as their preferred housing option, a well-kept garden or outside space of some description does tend to add a certain amount of extra appeal. This is quite amusing, really, given that most property landlords will agree that when it comes to the upkeep of a garden or communal area, it seems to be last on the list of priorities. Even the most conscientious tenant, who keeps a spotless house and looks after the inside of the property as if it were their own, can turn a blind eye to a weed-infected garden or unkempt lawn. Most council and housing association landlords have rules that specify that their tenants must keep their gardens to a ‘satisfactory standard’ as part of their tenancy agreement. What actually constitutes ‘satisfactory’ can vary from one opinion to another however and there are rarely set-out lists of things that a tenant must do in order to satisfy this clause of their agreement. What is Reasonable to Expect from a Tenant? 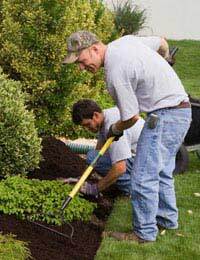 If your tenants have a garden to themselves, it’s reasonable to expect them to maintain the garden themselves. Or at the very least get someone else in if they aren’t keen on gardening. The minimum you should really be able to expect from any tenant living in your property is that it should be kept litter-free, reasonably tidy and not overgrown. If there are hedges they should be kept trimmed, especially if they are likely to encroach onto neighbour’s properties or public areas. Grass should also be cut regularly. In the case of rubbish – there could be comeback if a tenant lets rubbish build up on the property and it becomes a health and safety risk. Any build-up of litter, old furniture or rubbish can also attract vermin, which might result in even more expense getting pest controllers in to sort it out. What if the Tenant doesn’t Garden? It’s the experience of most property landlords that the garden is not usually kept as tidy as they might like – tenants seem to avoid gardening where possible and even a neat and tidy space can turn into an unloved weed-fest over a reasonably short period of tenancy. If gardens are an important part of the property for you, you could follow the example of one landlord who decided the way forward was to employ a full time gardener for all of his properties. Fed up with watching his carefully designed garden spaces turn into weed-filled wilderness, he decided to employ a local gardener to carry out basic gardening duties such as hedge-cutting, lawn mowing and keeping the gardens looking tidy. This only works if all the properties have accessible gardens and an outside tap for any watering, but it is an option for anyone frustrated with the lack of effort that tenants have made to keep up the outside areas. Some landlords take a stricter line with their tenants and prefer to stipulate that the tenant has a responsibility to look after the garden or else they will be penalised. If there is a clause in your tenancy agreement that forces your tenant to look after the garden, you can also introduce penalties for not doing so – withholding part of the deposit to pay for the garden to be tidied properly when they move out, for example. If the garden is especially important to you, it’s probably worth going down the route of hiring a gardener, especially if you own more than one property. You could either add the cost of the gardening to the amount that you charge for rent, and offer a tenant a discount if they agree to do their own garden, or simply add it on and let the tenants know that the gardens are maintained. In many cases, having a ‘maintained’ garden will probably be a selling point so you might find that this actually works in your favour. Another top tip is that longer term lets are a better option for garden upkeep – a short term tenant is likely to be able to turn a blind eye to the state of the back garden far more easily than someone who is there for a year or more, because most normal people get to a point where, even if they hate gardening themselves, they will get it sorted out just because they cannot bear the sight of an unkempt garden anymore! We moved to a property where the garden had no grass, was overgrown and full of stones. We cleaned it, planted grass and painted the shed. At the end there is a pile of rocks, which attracts stingy nettles during the summer and is difficult to maintain. We asked the landlord to clean it and the message through the agent was the rocks belong to the landlord and she wants to keep them there. We think she does not want to pay for the cleaning and that’s why she says to keep them there. Do landlords have the right to require from tenants to keep their mess in the garden? Thank you. My gardens are clean and gone. But I have old magazines and books in boxes in a locked outshed. Because the neighbor has had 41st problems....(which I havnt)..the council made me open my shed and coz it's stacked high with Xmas decs and wedding gifts....apparently I'm in breach of my tenancy agreement? They now expect me to put all my books and 700 magazine's into plastic boxes. Although if there are rats in my shed then a plastic box will be no bother as 1 rat. ?? last year ate Thro my black wheelie binkid while outside. Hello, I'm looking for advice. My landlord wants to take £200from deposit for "grass slightygrown" in garden,but I hadn't any mover or equipment for taking care of garden. Futhermore garden was in the same condition like we mooved in (in my opinion).Who's right in this case? I am in a rented property and have responsibility for the garden. During the storms one of the big trees blew over. No damage was caused is it my responsibility to get this removed? Or is this something the landlord should do through their insurance? I have a Tennant at the minute who had a greed at the time of leasing to look after the garden shed and wooden gates at the side of the property.It didn't mention the upkeep in the tenancy agreement but we had included it in the signed inventory that they were to be maintained. Does this signed inventory carry any weight as part of an agreement? I am a tenant in a housing association house and have lived here for over 20 years. When I moved in there was a small tree in the garden. It has now grown into a large tree (eucalyptus). I have had a visit from a association worker who said I must have it removed. Even though it was already here when I moved in I got quotes for the work and was shocked. The quotes are around £1600. I am a 72 year old pensioner who does sleep over this because I don't have that sort of money. @Smiler19 - has the neighbour not contributed? I think I would have left it and if the neighbour wanted a fence, the neighbour could have got one, or at least asked you to go halves. I'm sure the HA do put up fences. I'm sure all HA properties are not fenceless! I'd try and claim it back. I’ve been a tennent to a housing association for 20 yrs but next door is a private house, the previous neighbor and myself got on well so we never bothered putting fences up just planted for privacy, now she has moved out, and I have had to have someone come in and remove a lot of overgrown plants as I can’t manage the garden the same ( health wise) but now it’s is open, I was told that I’m responsible for putting up the fence, I contacted the housing and got told We Don’t Do Fences, if the neighbor wants it tell them to move the boundary, but fear of falling out with neighbors I’ve used £605 of my little savings and paid for them plus to have the garden sorted. I always knew I was responsible for the garden so happy to do this. But people are saying the housing should be responsible for fence. Is this right? I can only see upkeep/ presentable garden on tenancy agreement. Any help would be appreciated. Hi, we have just moved into a rented property, we have the basement flat with sole use of the garden. Upon deweeding and clearing the garden (completely overgrown and unkept) I’ve discovered that there is a lot of broken glass and rubble that has been left by the landlord (I believe they may have been paid to have topsoil/mud and waste dumped on the raised part of the garden). Due to this it’s not possible for us to plant grass or use the soil area of garden (making up 75% of the garden) due to the risk cutting ourselves like I did while Deweeding. Is the landlord responsible for making sure the garden is safe for us to use? Hi there, Can please someone advise me on a very critical matter. My dad has been trimming the hedge around our garden for circa 7 years. The hedge is 4 meters and higher in some places. My dad genuinely has no strength (60 years old) to continue with that, and money. He’s been trimming the hedge on a cheap aluminium lader on a slope on uneven ground, which I think implies some H&S issues (he felt a couple of times). My dad is a Local council (DGHP) tenant and would like to know who’s liable for trimming the hedge. P.s. the hedge is not joined with other neighbours gardens. Nad he is affraid if he will not trim the hedge there would be charges imposed on him. If your dad is a council tenant, responsibility for garden maintenance is normally dependent on whether the garden is for his sole use. If it is, as per his tenancy agreement (he may wish to read it to make sure), he will unfortunately be responsible for maintaining the garden. Can you advise who is responsible for the removal of illegally dumped rubbish in the car park assigned to the rental flat? Hi there we were renting a property but have moved. We are currently waiting for our bond back and received a email today from the property manager with concerns over a part of the yard that has weeds and grass clippings in but cannot be accessed it is fenced off and only way to get to it would be jumping the fence. Are we liable for keeping this area clean? There were also no prior photos to show the condition of this area before moving in. You would have to read the terms and conditions of your tenancy agreement which will tell you what you were responsible for maintaining. Hi. I rent through a housing association. Myself and neighbours were told before signing the agreement that the surrounding trees would be cut back before we moved in. Nearly 2 years on this still hasn’t been done. The trees are not on their land but all I have asked is for the branches that overhang the boundary should be cut back as I have 2 young children and feel this is not safe. Branches are almost touching the house now-it is ridiculous. I have contacted numerous people about this and nothing ever gets done. Surely it is the landlords responsibility to keep large trees cut back to the borders?? Your only recourse is to go through the process laid out via the link here. Hi. I rent through a housing association. Myself and neighbours were told before signing the agreement that the surrounding trees would be cut back before we moved in. Nearly 2 years on this still hasn’t been done. The trees are not on their land but all I have asked is for the branches that overhang the boundary should be cut back as I have 2 young children and feel this is not safe.Branches are almost touching the house now-it is ridiculous. I have contacted numerous people about this and nothing ever gets done. Surely it is the landlords responsibility to keep large trees cut back to the borders?? i live next to a privately rented property where the garden is more like a rain forest. this is becoming a problem as we share a front path. My husband spoke with the landlord today who's response was 'it's not my problem speak to the tenant'. There are mice and my cat has bought in a dead rat, where do we stand and what can we do yo make them sort out the garden. I've contacted the local council but as its privately rented they don't want to know. Hello Just want to know if having a communal garden, in a housing association property, Allows them to not attend the gardens if one sections off part of the garden but still has allowed open access at some point for others to go through...also if a fence with a gate now makes it private as opposed to communal even if other neighbours allowed access and have agreed ... The fact that it is still shared although fenced with a gate means it is still communal does it not ..and that they still need to mow lawns etc as they have been doing ? Hi, we have been living here in a privately rented flat for 4 years. We have access to the front garden which has been badly lined andgravelled and weeds are a constant problem. We asked our landlord if he would mind us putting a lawn in at our own expense. He refused but did say he would sort out weed killer. 4 years on he has never been anywhere near with weed killer and even if he had quite frankly it’s uttely back breaking work. Last summer I decided no more, I had noticed grass growing by itself so I just looked after it and my lawn has started to thicken out that was until last weekend when the landlord turned up unannounced and sprayed the garden. My question is should he have sought my permission beforehand? I am worried that the spray may have an effect on other plants I have out there. You would have to look at the terms of your tenancy agreement to find this out. I live in a housing association home, the garden is on a huge slope and I can't cut the grass without falling down it. I have asked them over the phone if something could be done, they said it's my responsibility to maintain it. I argued it's the steep slope which is a mound of mud that was just left there when they first built it. They said it's not their responsibility still. As it is a hazard and I can't use my garden can I take this issue further with the council? You can take the matter further via the link here . Much depends upon what you agreed to when taking on the tenancy. If you agreed to maintain the garden as it was when you viewed the property - then you may not have a case. However, if the garden is visibly impossible to maintain due the HA's fault, then you may have a case to answer. Hi ya, when I moved in the garden was in a state and the landlord said they would out right when I moved in and they haven't it's still full of old rubbish and extremely over grown and is now refusing to do anything about it despite complaints from the naughbours.Where do I stand? You can see more via the Shelter link here, which will inform you of some options. Hi ya, when I moved in the garden was in a state and the landlord said they would out right when I moved in and they haven't it's still full of old rubbish and extremely over grown and is now refusing to do anything about it despite complaints from the naughbours. Where do I stand? @Weedsaremylife - I'd write to the landlord and explain your predicament. If the landlord does nothing, then your only choice is to move on to a home more suitable to your needs when your agreement ends. I'm sure if you are a good tenant in every other way, your landlord won't wish you to leave. It sounds like the problem will be ongoing whoever lives there. Hi, does anybody know where i stand with my landlord. We moved into a property that is entirely gravelled. We were told it had been lined and gravelled so would be low maintenance. However, weeds sprung up almost immediately like a sea of cress and I took days off to get it sorted because the landlord rang our agents to complain to us about it. On closer inspection the gravel she has used is full of soil so it wasn't clean gravel to start with. It's spring now and the weeds are worse than before and I'm spending all my free time weeding it. I have sciatica so it's excruciating but I don't know what to do. I've spent lots of money on weed killer, sprayers, all sorts but it's not helped. I've even sprayed it all turned it over with a rake and sprayed it again. I asked the agent if she could ask the landlord to help or to compromise and was told she won't because she's already paid to have it lined and gravelled. The gravel used was full of soil so of course it sprung weeds! I don't know what to do, if i give up and let it get weedy it then I'll get penalised when I move out surely? Do I legally have to keep it weed free? Do I have to employ a gardener? I wish it was a lawn, I actually like mowing grass, much easier. Any advice greatly appreciated. We have just moved out of a property where the only clause relating to the garden is that it must be kept “clean, tidy and free from rubbish”. The landlord is trying to take £225 from our deposit: £125 saying that a gardener was needed to make tidy (I have pics dated the day before tenancy ended that show a tidy garden in my opinion! ), £30 for moss killer because of green decking and sleeper bed walls - again I have pics showing none green decking and minimal green to sleepers which also form part of the path in the garden (his responsibility?!) and £60 for new turf. This is based on 12 square meters (area actually measures 8) and there is grass there just some thinning where it literally won’t grow because it’s behind bushes so never dries out! What are our chances of getting some of the money back? I’m livid! Hello, we have just moved into a rented, detached house which has aproximately half an acre of lawns to be cut and boarders to be tended to. This is the first house with a garden, that hadn't provided gardening equipment! Is it unreasonable to expect the landlord to provide it's equipment for us to keep on top of the gardens? The information regarding whether your landlord provides tools or not, will be contained in your lease. There is no specific obligation.